I am in love with a man. His name is Claude. Claude of Patisserie Claude. But he’s married. That’s okay. I don’t love him THAT way. I love him because he is just about the kindest French baker I’ve encountered in my life. It doesn’t hurt that his croissants leave me in a blissful state where my eyes go all cloudy staring off into space, attempting to comprehend how, HOW anything could taste that incredible. It all started Thursday morning. 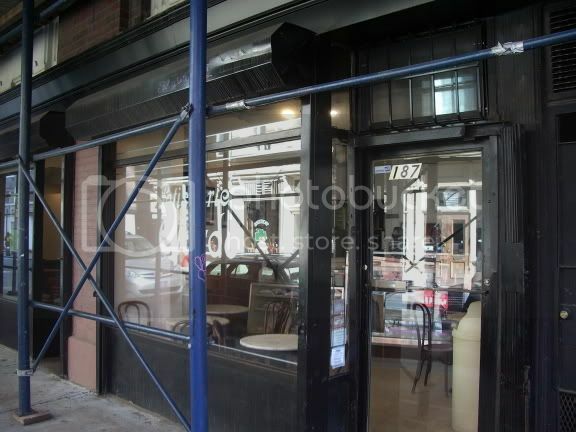 It seemed as if everyone in the city but me had experienced one of Claude’s emphermal croissants. That would need to be fixed. As a lover of buttery baked goods (aka croissant and brioches) it would be a sin to neglect visiting the patisserie. It’s a modest tiny place along West 4th street, very humble looking with three small tables in front of the bakery counter. Claude and a single assistant (he has one during day and another at night) work in the open kitchen while another lady handles the register. I arrived at 8:30am and ordered a croissant($1.40), and then, remembering the $2 minimum to sit in the patisserie, added on a cup of coffee. The coffee was fine, but the croissant. Oh god, I think that croissant alone made the price of my plane ticket worthwhile. 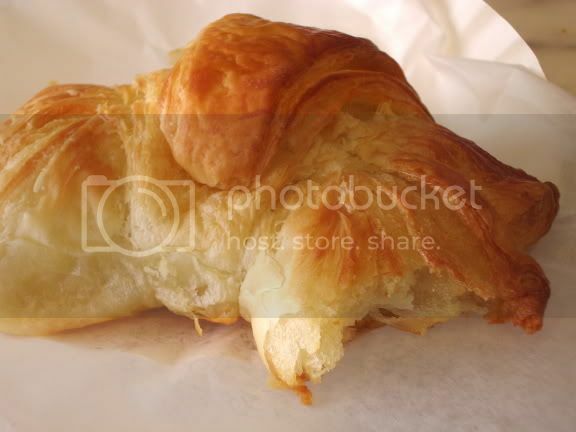 Warm, flaky and perfectly browned on the outside, bits of croissant shards fell onto my lap with the first bite (see how I was too weak to resist biting before the picture?). I’ve never had such a crisp or finely shaped croissant in my life. You’d then be led to think that it would be impossible for this pastry to have a layered soft and dough inside. BUT IT DID! Oh my god. I don’t know how it happened. But look! Layers upon layers of soft buttered dough! You could pick out every one of the folds Claude made in the process of layering thin slices of butter over and over again until THIS. I finished the croissant and I was full. But my eyes were not. A batch of brioche was just taken from the oven. Warm, no, HOT brioche. I cannot stop myself. There was still a half cup of coffee left. Coffee needs a companion. 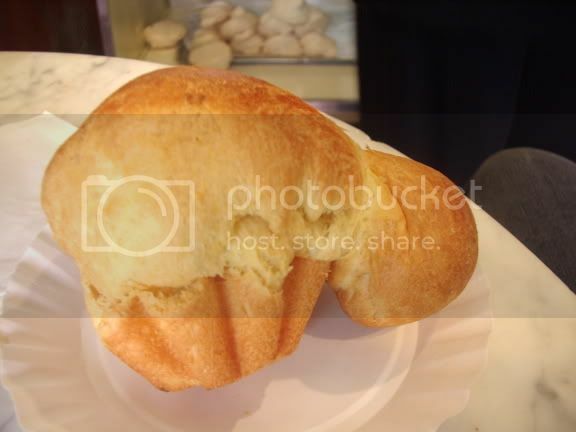 Brioche. Brioche. And somehow, by magic I suppose, I found the toasty hot creature ($1.4o) sitting in front of me. That was when Claude started to notice. You see, most people have one pastry for breakfast, not two. Especially not small sized people. I’m okay sized I guess, but I don’t think he expected me two have two buttery pastries at 8 am, one after another. I love brioches. They’re my favorite kind bread/pastry. And Claude’s did not disapoint. Look, see how this magnificent butter based yeast pastry just plumpooded over while baking! 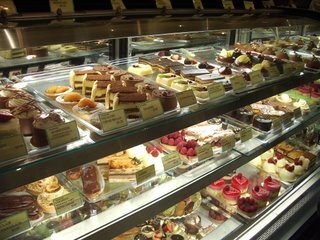 My afternoon adventure included a visit to Mama’s in Queens (to be posted next) eating incredible roast pork subs and picking up desserts for friends when something in me said, hey, I should buy a box of Italian pastries for Claude. Never mind the fact that he really had no idea who the hell I was, much less know my name. Either way, buying sweets for a “stranger” never backfired on me yet. “What is in that box?” he demanded. I obligingly handed it forward and Claude opened it with the precision of a man who has open many bakery boxes in his life. He examined the contents, “very good” and handed it right back to me. “Ahh” he pondered for a moment, “why you give me?” I was stuck. What was I supposed to say, er, I loved your brioche and croissant so much that I’m attempting to show my appreciation for your exquisite baking through a box of Italian sweets? “Eat,” he says sternly, “tell me what you think.” In no position to argue I take the same seat I occupied this morning, the one nearest the heater. I get cold easily and the warmth makes me happy. “Okay. Good. 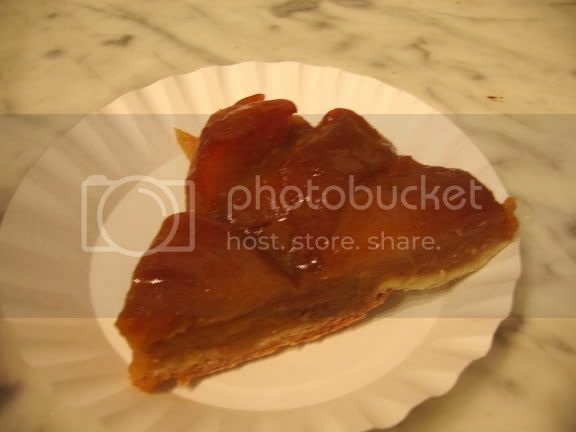 You eat this.” And like magic, a modest brown rectangle with a reflective golden top is set in front of me. This is Claude’s espresso mousse napoleon. I never had anything quite like this. 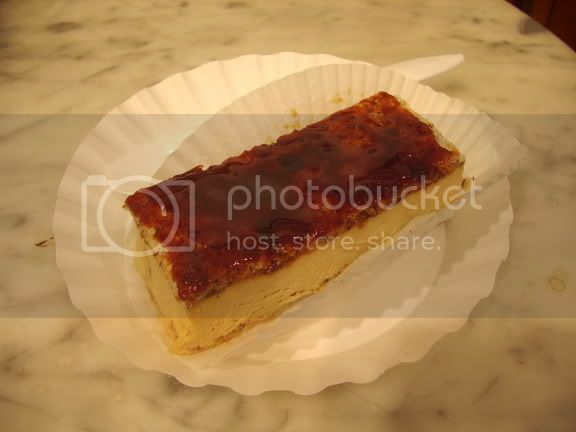 Aside from the crispy layer of caramel topping the napoleon it is not sweet at all. Is this dessert made for me? I wonder. I love sweets, but they are often cloyingly sugary and leave me with a toothache. I taste a cold mousse wavering on the light gelatin-like side of pure espresso. It is as if I’m having soft espresso gelee. “It is so good Claude!” I feel like an idiot. 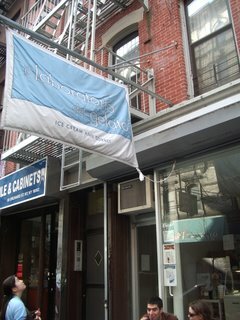 This amazing pastry chef practically feeds me the most wonderful treats and the best I can do is say that it’s ‘good’? God, I’m a moron. I don’t deserve this. But I love it at the same time. I try explaining to him why, “It’s everything I want in a pastry. I want the flavor, not the sugar. It is so clean, so pure!” And I hope he understands. Maybe he does, maybe he doesn’t. “You will start with the pain au chocolat,” he states as a matter of fact. ‘To start’, that means it will not end there. I leave the patisserie very full and in a strange state between bliss and wonder. 8am cannot come soon enough. I am disapointed to discover I am the second customer of the morning. A young man is already sitting at my table, croissant in hand, NY Metro in the other. That’s okay. Claude sees me enter and takes a pain au chocolat from the kitchen, not the bakery counter, places it on the now familiar white paper plate and hands it to the same Spanish girl who served me yesterday. “$2.75” I hand over the money and this time it is accepted. I sit at the seat that is not my seat and begin. It is the same dough as his traditional croissant, yet I still marvel over the miracle of this creation. How can something bear a beautifully browned and crisp exterior but have an interior boasting dozens of folds, each one evenly buttered and puffed up but still doughy all at once? In the chocolate version, a precise rope of melted dark chocolate is evenly distributed throughout the croissant. 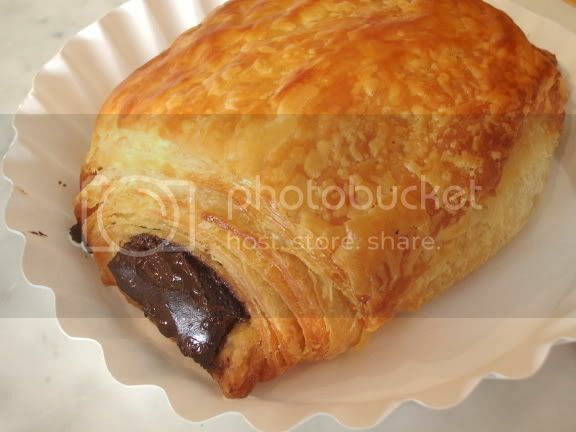 Every bite yields a taste of the warm chocolate mingled with the crunch of the croissant and the buttery soft layers of dough. I am not finished. There is more to come. “Yes, the quiche today is very good. I will warm it back up for you.” I move back to my seat as that NY Metro reading male has left, probably back home to his lovely loft in Soho. It takes about five minutes for my quiche to be ready. “Thank you,” I say, handing over three one dollar bills. It’s funny. After trying so many pastries and sweets here I am scared of being disapointed and encountering something that is not spectacular. I hesitate before starting the quiche. And I was proved wrong. I’ve never been so happy to be wrong. The quiche, even after the pastries I would have tonight, was the best item at Claude’s. Even better than the croissant people rave over. If I had it my way, I would be still eating it now, spooning each light eggy bite touched with silvers of endive, and just the right amount of guyere cheese. It is just like that. I want to cry, it’s so good, unlike any quiche I’ve ever had. The egg is wobbly, barely cooked, depending on the warm flaky shell to hold it together. The crust has a just a memory of salt between the numerous layers of savory buttery crunch. It is spectacular. I want to jump up and do something, anything, but I just sit there basking in my own self-found happiness. I come back around 5pm the same day. 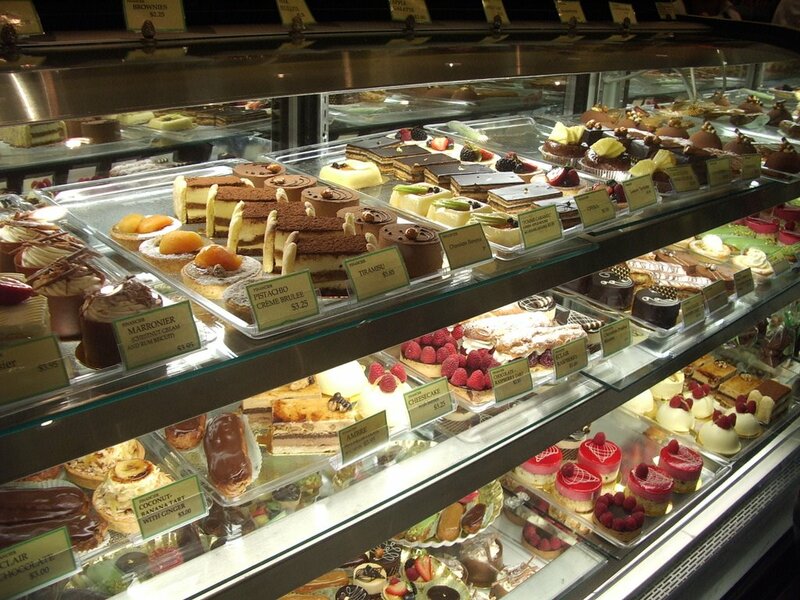 This will be my last visit to the patisserie. Not because I am leaving but because I cannot help myself. Everytime I enter though the doors, I inevitably leave two pastries heavier. It all feels delightful as I consume the pastries but I’ve never been so full in my life. 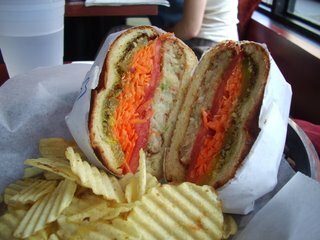 My daily visits to Claude’s are combined with dinners at Balthazar and Italian roast pork subs from Mamas. I cannot continue to do this, I feel as if my heart will fail if I continue to average four pastries a day. (I told a friend, “I feel like there’s three 1-pound blocks of cold butter sitting atop my heart, pushing it down.”) So I will stop. After this visit. There’s no need for further description. I loved it as much as I loved everything else he made. True to his word, the lemon curd was soft and sublime with the flavors of lemon, barely sweet. “Anything you want.” I move my eyes away from the cake side of the case and towards the cookies. I’ve been eyeing this massive, dollar bill sized meringue since yesterday. 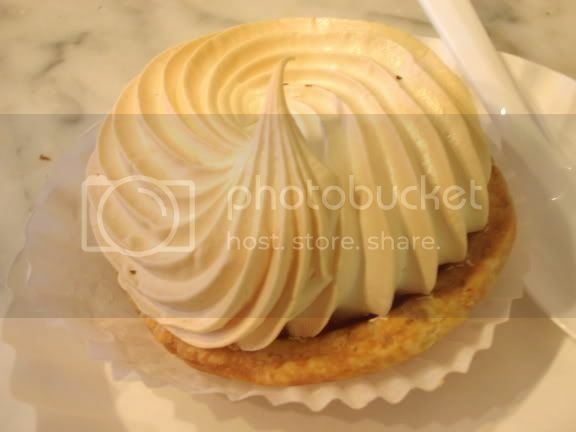 I know it is only a meringue, any one could whip one up with a few egg white and sugar at home, but this is what I want. 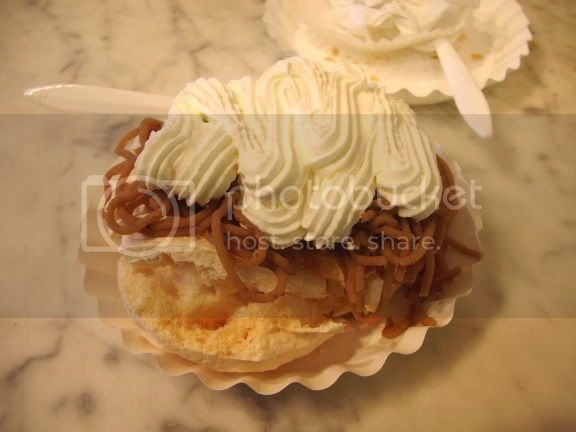 “The meringue it is,” Claude removed the delicate mass but before placing it on the plate he whispers, “chestnut puree and whipped cream on top?” as if this was an illicit secret we must share with no one. “Oooh, yes. please do.” He goes into the kitchen and does not come out for a very long time. I wonder what is wrong. I step a bit behind the counter and try to see what is happening. I spy his back, leaning over the metal counter. His right elbow moves back and forth. Everything is alright. I just need to be patient. Claude comes out of the kitchen, a modestly proud expression on his face. He know he has created something spectacular. I pack my bag, getting ready to leave. I’ve had eight pastries in two days (not including a Italian dessert venture in Queens and cakes from Blackhound). It’s all wonderful, but I my stomach can’t hold any more. Before leaving, Claude hands over two delicate macarons. Tiny precious creatures. I hold them like pieces of gold. We shake hands like…I don’t know…like two people who love to bake and eat, or maybe two people who love meeting strangers and building relationships on a whim. 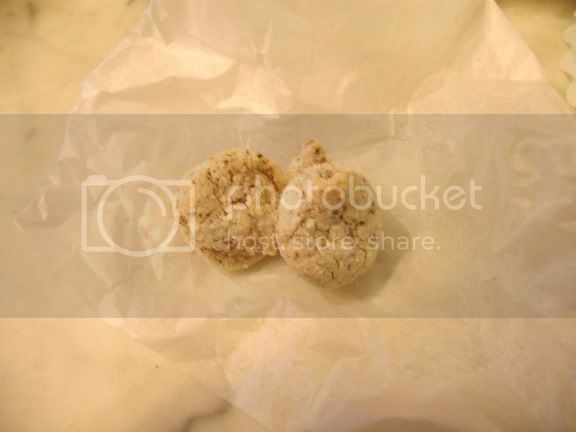 I walk out the door, pop a macaron in my mouth, perfectly content with how the nutty bit dissolves in seconds, leaving behind nothing but traces of wonderful memories. I will see you next year, Claude. Ooooh. I’ve been waiting for SO LONG for this bread pudding. All last year, all summer and finally – now I have it! I could never justify paying $12.50 for a slice of bread pudding (and still can’t believe I did it) so I only got as far as the entrance of Blue Ribbon Bakery while at NYU last year. But I had to have it. What if I got run over by a car tomorrow and died never having the only bread pudding I really wanted to try? A sad life that would be! Robyn and I tried to get in on Thursday night but the wait was too long so we had dinner at Pearl’s Oyster Bar. I’m acutally glad it worked out that way because that was a mighty mean buttery lobster roll! I came back with Shann this time, around 12:30 am when something inside of me declared “you shall not sleep well tonight unless you have BREAD PUDDING!” So we made a midnight trek to the elusive Downing Street. We were quickly seated as the restaurant was only half fun. Yes! 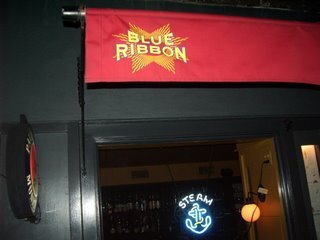 Never thought I’d see the day where there’s no wait at Blue Ribbon. 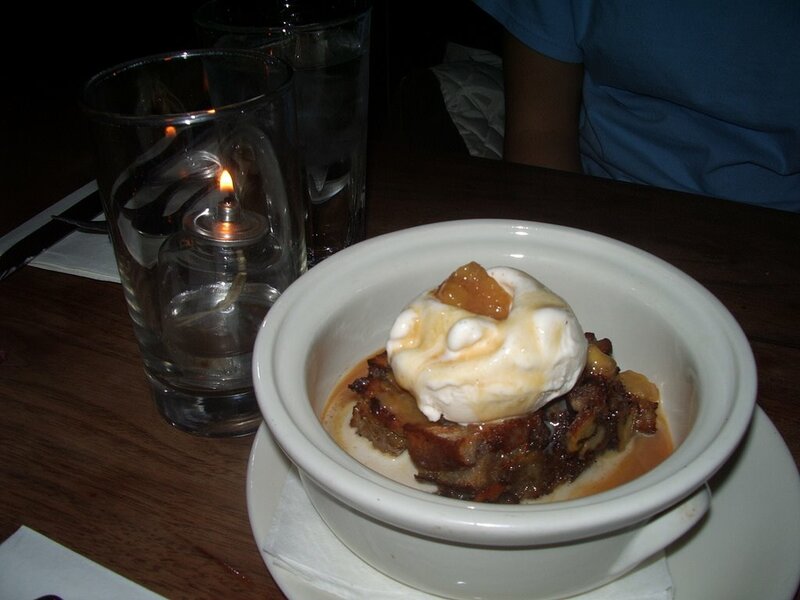 But then again, how many people crave expensive bread pudding at 12:30 in the morning? Here’s the deal. They offer two types – chocolate chip and banana walnut. This is a problem because I love both chocolate chip and banana walnut bread pudding, but I’m sane enough to not invest $25 for both puddings. I hemmed and hawwed and sought out my very attractive waiter for advice. “AHH, I LOVE YOU!” (not quite to that extent, but I did express an unusual amount of gratitude). Hehehe. So I got BOTH. For the price of ONE! The chocolate chip was topped with a vanilla ice cream and a heavy hand of hot bittersweet fudge. Oh, indulgence indeed! The pudding was crusty on the outside but soft and squishy after breaking though the chocolate chip charred shell. 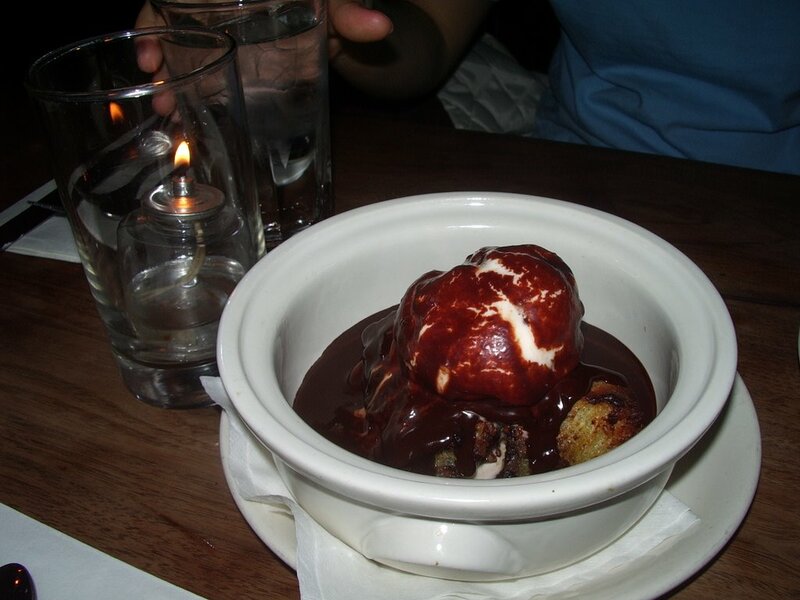 The ice cream melted quickly, requiring strategic spoon movements, picking up the right size of pudding, a scoop of ice cream and dragging it though a pool of bittersweet fudge in a matter of seconds. What happened with the leftover fudge? 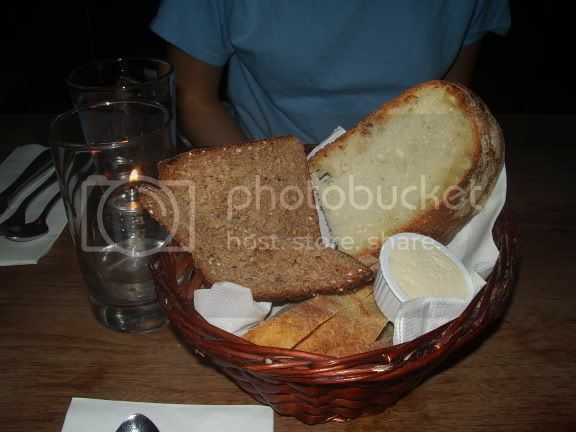 Why the basket of half eaten sourdough begged to be eaten, bread and chocolate, who would refuse? The combo brought back memories of my toast and nutella days, only better. The banana walnut was a welcome change from the heavier chocolate chip pudding. Again, the same crusty exterior (I think they cut each piece from a large pan and then heat it up on it’s own so that all four sides and top were crunchy. There were both chunks and smushed up bananas layered with the bread. There were too many walnuts for the size of the pudding, so I felt a little gypped on that end (I paid $12.50 for pudding not walnuts!) This was topped with the same vanilla ice cream but a caramel instead of chocolate sauce. 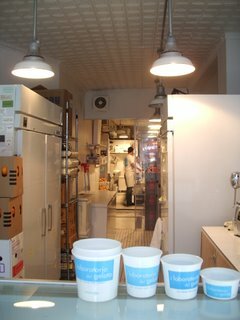 The caramel was smooth and warm, lacing the pure white ice cream. Nearly all the ice cream melted into the pudding by the time my spoon made it’s way here but the hot and cold, soft and crunchy mess was a delight to indulge in. I still can’t decide. I love them both. Chocolate and bananas are so different- it would be unfair to compare them! Located underneath the Manhattan bridge is another world. It’s not the Chinatown on Canal Street but the real Chinatown. 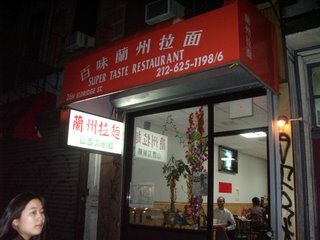 The Chinatown where no menus are in English and where you would be hard pressed to find someone with hair that isn’t black or brown. I first heard about Super Taste’s hand pulled noodles from a Chowhound post. There would be the occasional rave from a friend about how they “really make the noodles right in front of you!” and “it’s soooo good.” Hyped us to such a degree I was slightly let down by the dishes at Super Taste. The first sign was the English menu. I suppose once upon a time, a long time ago, the menu was in Chinese. But then someone “discovered” the restaurant and it became popular – tourists, foodies and chowhounders trekking in for a taste of these high touted hand pulled noodles. The menu would have to be redone in English to make everything more accessible for customers. 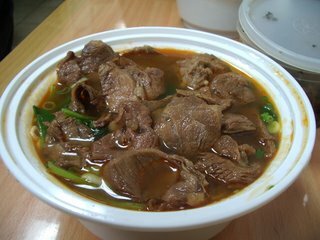 Flavors need to be adjusted, the spicy beef noodles can’t be too spicy, plastic bowls to cut down on the costs, mass production. And from there everything goes a little downhill bit by bit. The Spicy Beef Noodles was uninspiring and left me feeling, “so what?” The noodles, hand pulled by a lady in the open kitchen, were on the softer side. I prefer soft over harder noodles but theses were just kind of bleh. Like flavorless noodle shaped dough. The soup was greasy, just a tad spicy with an appropriate meaty taste. The little pools of spicy oil on the surface of the broth was attractive upon first glance but left me with a headache and feeling like there were vats of oil floating somewhere between my throat and stomach. Exactly. And this is coming from someone who can handle very spicy food and immense quantities of MSG! The only redeeming factor was the soft, spicy slices of beef. Fat and meat found a nice ratio compromise, the occasional bite meeting a welcome surprise of flavorful fatty goodness. The oxtail in the Oxtail Noodles were a joke. 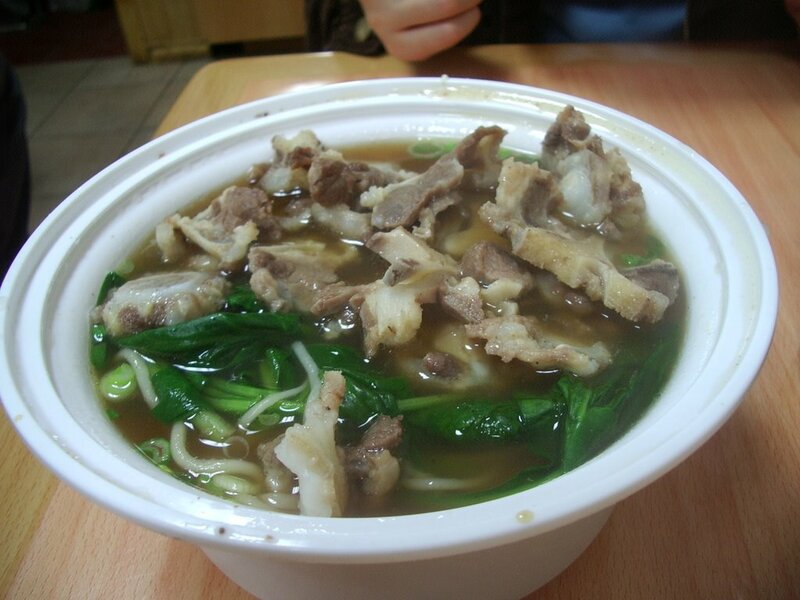 Brittle thin slices of oxtail littered the soup, even then, the oxtail were there more for appearance than taste. There was no meat on the bones, though we found the occasional piece of fat. Soup here was passable, not nearly as greasy but wavering on the bland side. I think I’ll stick to Bo Ky on Bayard for my noodle soups but at least I got to see what this “hand pulled” hype was all about. 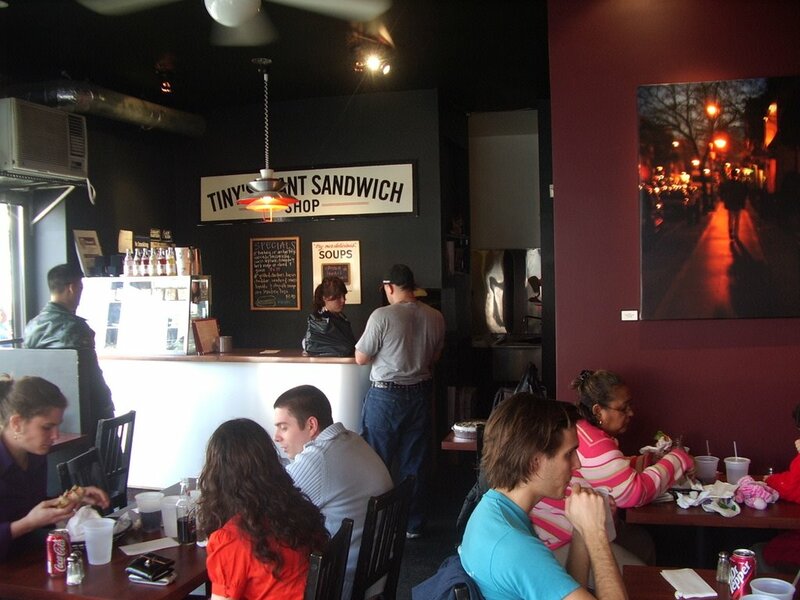 Sandwiches at Tiny’s left us full but the stomach which holds savory foods is a completely separate entity from the stomach lucky enough to store sweets. 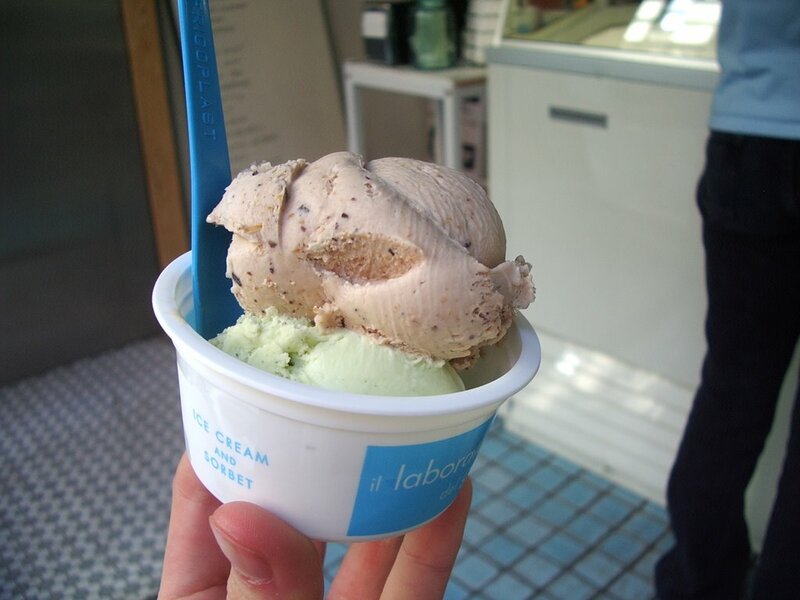 Naturally we wandered in the direction of Il Laboratorio del Gelato, anticipating little blue and white cups bearing the scoops of cold sweet wonder. Upon examination of today’s flavors and a sampling of the toasted almond and pistachio I choose a scoop of fresh mint and black mission fig ($3.25 for a small). It tasted just as the name promised. The fresh fig, a creamy brown concoction studded with bits of sweet figs was so simple and basic that it had me sitting in stunned silence. I am spoiled and can never eat gelato elsewhere (except for Mario Batali’s olive oil gelato). All I could taste was cool, creamy figs. 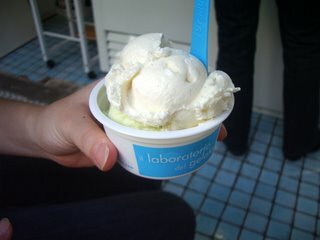 The gelato was sweet only to the extent that a natural fig would be and nothing more. Oh sigh. Good food makes me so happy! The mint was equally stunning. What makes the gelato here a success is that everything is SO FRESH. You taste the FLAVOR of that item and nothing else. It was as if Mr. Snyder chopped up fresh mint and magically turned that batch of plain mint into gelato. Both flavors were very dense, but not too thick. It melted gracefully on the surface of your tongue and gently slipped away, leaving only the memory of a taste so spectacular you could hardly imagine it to be true. Shann ordered the vanilla and fresh mint. I only had a small taste of the vanilla and after tasting the fig and mint, was less shocked by the buttery smooth texture. The vanilla was pure and simple, gently flecked with specks of vanilla beans. $3.25 for a small cup isn’t cheap but surely not unreasonable for the quality you receive. It’s small shop with a small bench in and outside the shop, enough room for two to three people who just want to bask in the delight of wonderful eating. I met Shann on friday morning and we both walked down from Union Square to her dorm in the financial district. We planned out the whole day with no plans. Make sense? Well our plan was to eat and walk the whole day only we didn’t know where. Sometimes that’s when the best eating is done. Walk, talk, walk and stop when something looks good. Only in the city is this type of approach towards eating possible. We whipped up a quick batch of mango mochi to munch on because no true local can go very long without eating mochi! 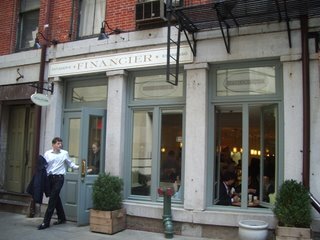 On our way towards the lower east side, we made a quick detour and peered into Financier, taking in the pastel macaroons and dainty tartlets. 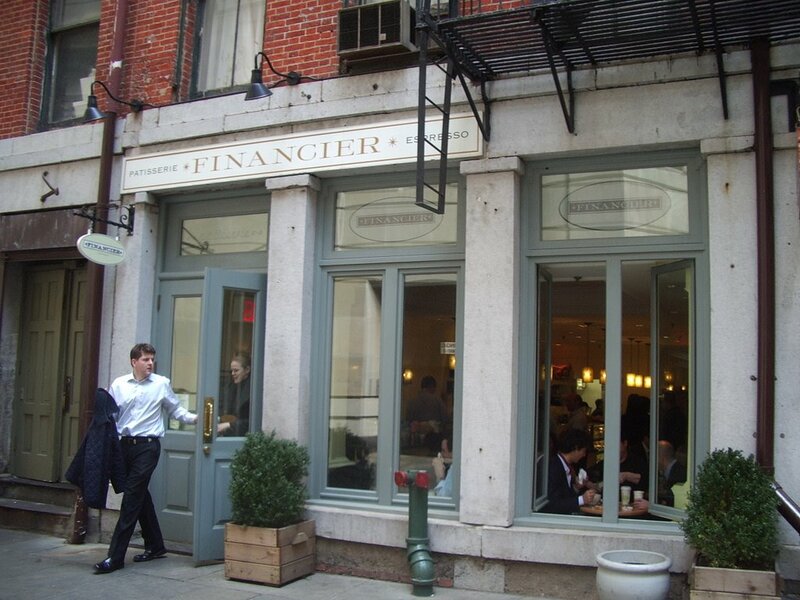 The place was beyond crowded with the wall street lunch crowd feasting (although nibbling is a more appropriate word consider that they really emphasize quality over quantity here). Lunch stop at Tiny’s Giant Sandwiches Shop on Rivington. It took us a while to get seated and I had an awful feeling that the service was going to be very slow. 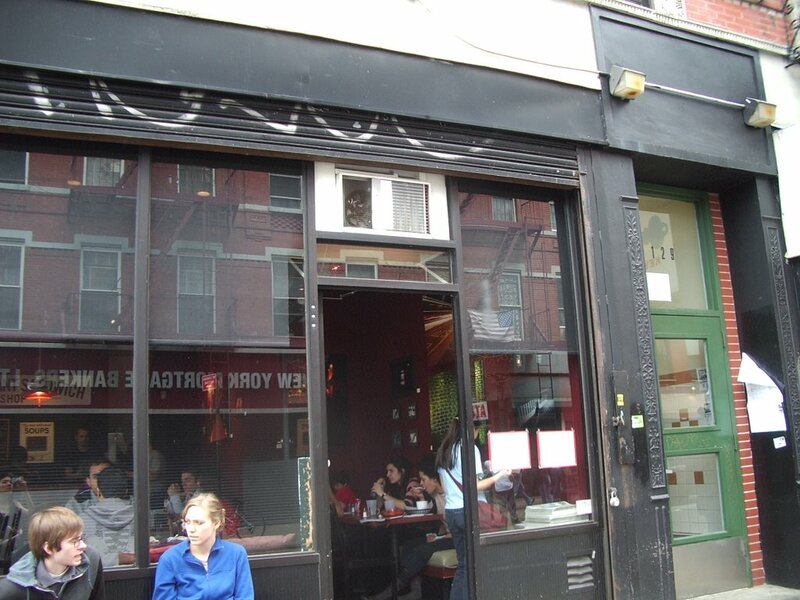 Fortunately I was proved wrong as the last turnover of “prime lunch time diners” left and the place calmed down. As expected, the menus centers on sandwiches with daily offerings of soups and salads. Shann and I ordered two sandwiches and split them. The first was the Silly Philly Portobello – grilled portobello mushrooms with sauteed onions and melted swiss cheese on a semolina roll ($3.95) It was a mighty big sandwich for that price! 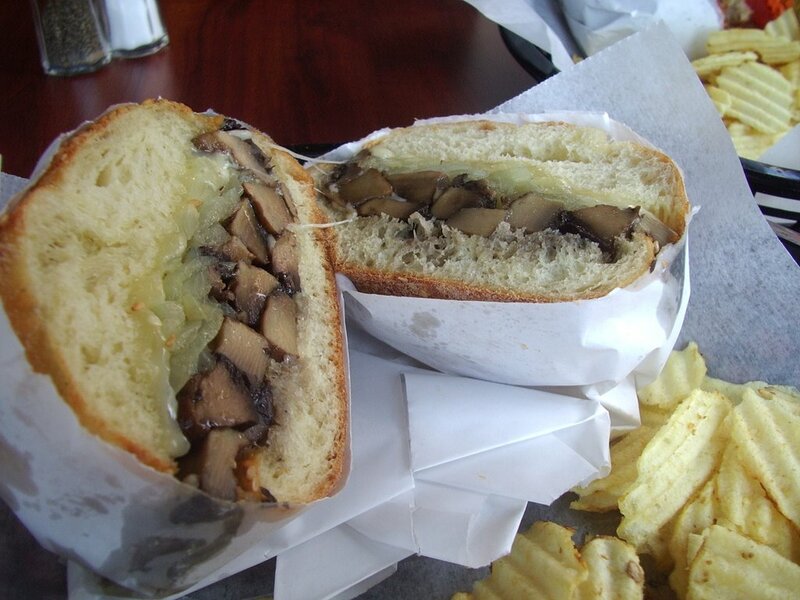 I was expecting a whole portobello mushroom, but instead they were cut up into large chunks. 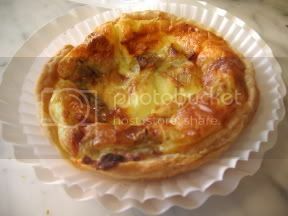 A crusty roll with a baby soft interior hugged the warm and buttery onions buried beneath a pile of melted cheese. Instead of ordering the second sandwich off the menu, we went for the “create your own” ($3.75). After much indecision (there were far too many choice for indecisive people like me!) we went with the hot crabcake on a butter toasted brioche with pickles, tomatoes and onions with a basil pesto spread. As odd as it may sound, it was the best choice I made in a long time. Crabcakes and brioche were made for each other! The brioche bun was butter and grilled like the buns Pearl’s Oyster bar. The crab cake was bland on its own but paired with a tart bit of pickle, some tomatoes for sweet moisture and a savory pesto each bite left me smiling with satisfaction. I must have looked ridiculous. The chips on the side are ordinary salted potato chips, I ate half plain and jammed the other half into my sandwich. Nothing like an extra crispy crunch!